by Telka Duxbury. Written on 2013-11-13. Published in Reviews from the ISE Chronicle. At the Internet Shakespeare Editions, we take great pride in the worldwide network of Shakespeare lovers that we have built over the years, and we never tire of seeing just how many ways the Bard’s genius gets translated and repackaged. 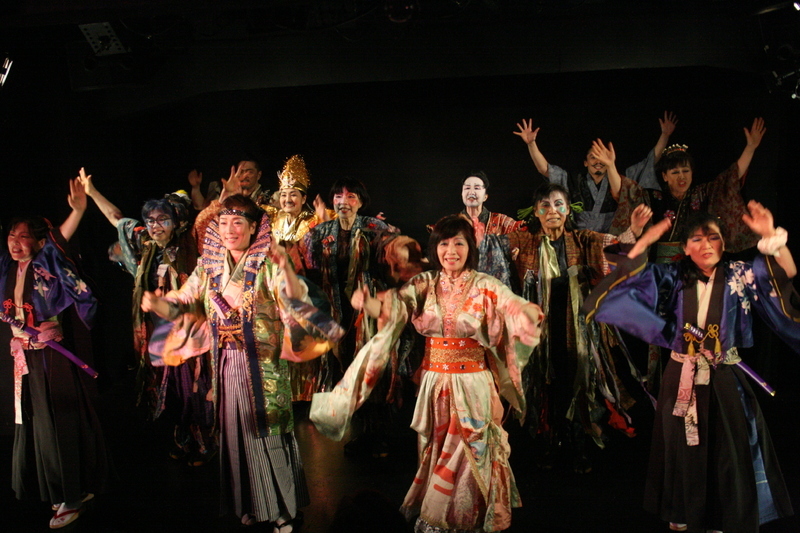 So, when Miyuki Sakaguichi, performer and social media coordinator from Ryuzanji–a Japanese-based independent company for senior actors–invited the ISE team to see their Rakujuku Kabuki-style adaptation of Twelfth Night at the annual Victoria Fringe Festival, the ISE team hit the Metro Theatre to catch this must-see production. Dating back four centuries, Kabuki is a popular Japanese theatrical convention that uses song and dance to produce highly-stylized, richly staged dramas. The troop–with an average age of 61–produces an intelligent and complex adaptation of Twelfth Night that revels in themes of inversion and translation. Set in imperial Japan and performed in Japanese with English surtitles, the production is gleefully aware of its convolutions and transpositions. True to the Rakujuku form (Rakujuku loosely translates as “having fun troupe”), the players capitalize on the dramatic irony inherent in the romantic sub-plots. Like traditional Renaissance theatre, all-male casts perform conventional Kabuki; however, Ryuzanji turns the table on gender by featuring an almost exclusively female cast. This inverted Kabuki form intensifies the already complex gender roles explored throughout Twelfth Night. 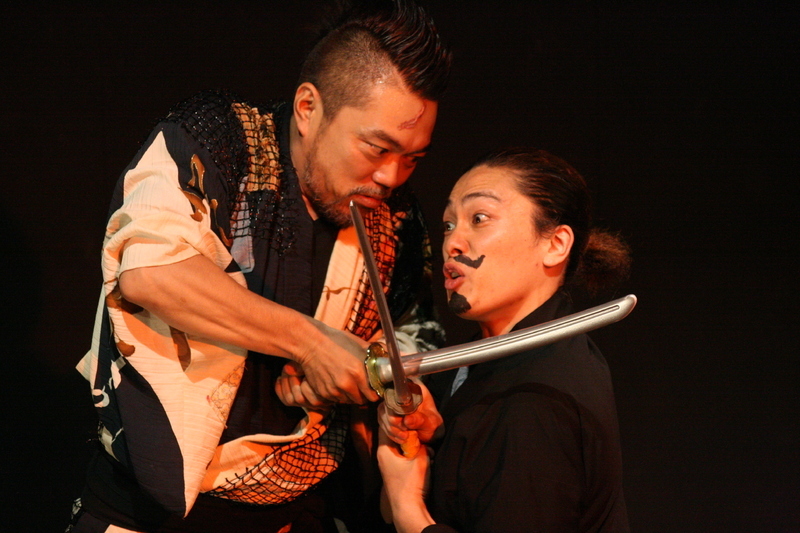 While the heteronormative male characters (Sir Toby, Sir Andrew, and Malvolio) are played by women, Antonio is played by the only male actor in the cast, Takuhei Kozu, which amplifies the character’s implied homosexuality, as he openly devotes himself to Sebastian (Mitsue Naito) and humorously plots for them to run away together. Duke Orsino (played by female actress, Izumi Murata), on the other hand, fully embodies the authoritarian male stereotype in his relentless pursuit of Lady Olivia (Kazuko Kawamoto) despite her impassioned rejections. Lady Viola’s (Yuko Sekiguchi’s) double gender inversion (a female actor playing a female character in a male disguise) generates metatheatrical moments in which the audience contemplates the comedic (and perhaps social) implications of Lady Olivia’s infatuation with Cesario (or rather, Lady Viola). By choosing to marry for love, rather than money, Lady Olivia undermines the vulnerability and docility characteristic of women in early modern London and Imperial Japan. Her autonomy, however, is attenuated by the comedic implications of her infatuation. Onstage, Lady Olivia’s bold pursuit and aggressive seduction of Cesario depicts her as an older woman with a sexual appetite for a younger man. Knowing, however, that Cesario is actually Lady Viola–and that Lady Viola is played by a female actor–the performance challenges assumptions of female sexuality. While the script itself determines the romantic fate of this foil, the sexual implications of these gender inversions undermine cultural stereotypes and presents a political message normalizing taboo topics such as transvestism and homosexuality. Despite the intercultural metatheatrics, the Japanese aesthetic informed all aspects of the production. Traditional Japanese cultural items like fans lent themselves to the play’s actions and added symbolism to dialogue and soliloquy. When Lady Olivia authors a love-letter to Cesario on her fan, for example, the feminine prop transforms into an emblem of autonomy. The exquisite design and structure of the kimonos worn on stage provided not only a stunning contrast to the minimalist set design, but also emphasized the gender inversions and challenged cultural assumptions. In contrast, the in-text costume cues provided directorial challenges. Director Show Ryuzanji transforms Malvolio’s (Aya Meguro) yellow stockings into a particularly ostentatious gold crown and a gold loincloth, though the cultural significance was never quite explained. Ari Miyagawa and Emi Takemura’s choreography accentuated the Japanese aesthetic with movement. In the production’s best musical scene, the cast, meticulously arranged in tight rows, synchronously pivots around the stage with military precision in clockwise and counterclockwise fashion. In another memorable moment, Malvolio (Marui Sandayu), falsely accused of madness, executes sumo-style movements as he prays from his cell. The ceremonious lumbering does not temper the tenderness of Malvolio’s romantic confession. In fact, the purification ritual underlying the movements of this popular sport intensifies Malvolio’s vulnerability in this scene. Decoding Shakespeare through a transnational lense, Ryuzanji embraces themes of translation. The surtitles functioned sometimes as English-as-an-additional-language translations, but also sometimes as metatheatrical cues. Cesario’s soliloquies, for example, were not translated on screen, but rather, were framed as another indulgent “monologue.” Similarly, anachronistic allusions to Western pop icons (such as Avril Lavigne) and local toponyms (such as The Empress) flattered and delighted the local Fringe audience. 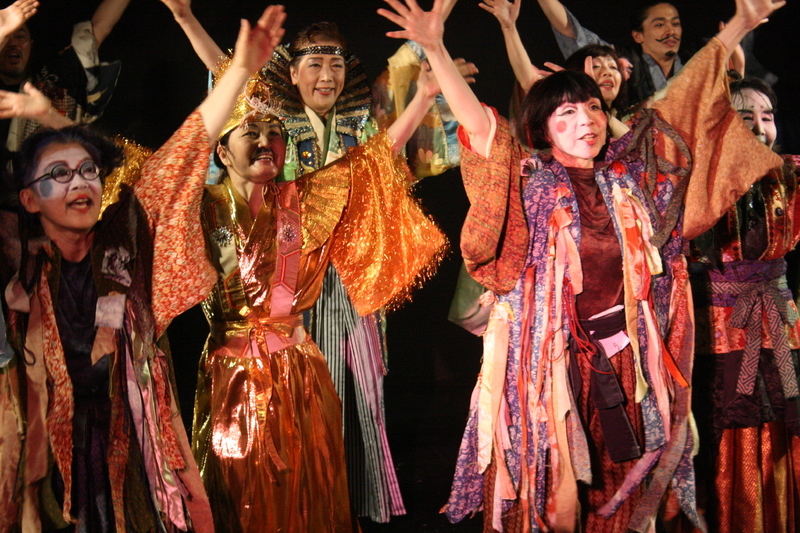 Paralleling Baz Luhrmann, the musical segments integral to Kabuki theatre provided playful intercultural and intergenerational accessions to the script. As digital editors of Shakespeare, we perceived the metatheatrical moments as opening and closing tags. Like the metadata we use to render, interpret, and display Shakespeare’s works, Ryuzanji uses translation and inversion as devices to subvert theatrical conventions, such as surtitles, to explore cultural codes, such as gender performativity. These moments occupy a dual position in the performance: they express formal elements intrinsic to the text (and the stage), yet they also contain meaning independent from it. In a play so conscious of its own playfulness, this witty and insightful adaptation of Twelfth Night promises to get you laughing–and thinking.